I had just turned 3 when Jonny Quest premiered in 1964, so I don't remember watching the show until it was on Saturday morning reruns later in the '60s. I remember thinking how great it was that adults had put so much effort into the art for a "kid's" show. I didn't learn until the 1980s that Jonny Quest was a prime-time family show. I watched the episodes every Saturday until my early teens, when I started sleeping until noon on Saturdays. I didn't pick up the series again until it was part of the "Funtastic World of Hanna-Barbera" show, which was a syndication package released in 1986. I got up early on Sunday mornings to tape the episodes and cut out commercials (because blank tapes cost $6! ), then taped them again when they reappeared with the original end credits. The first showings had generic credits that scrolled rapidly across a blue background. I found out later the episodes had been edited and sped up to cut the runtime by about four minutes. Around this time, I went to a Dallas Comicon convention and saw Doug Wildey, but only from a distance. He was there to promote the new JQ comics by Comico. Sometime around 1990, I began researching Jonny Quest. Without the Internet, the research opportunities were all print-oriented. I found what I could in my local library, then drove to one 60 miles away because it had an archive of TV Guides from 1964. I built an episode list and found out some things that intrigued me: "Arctic Splashdown" was called, "Splashdown Antarctica"; "Calcutta Adventure" was listed two weeks in a row; and there was no listing for "Riddle of the Gold." I was a newspaper reporter at the time and decided I'd try to freelance an article about JQ's 30th anniversary in 1994 to a magazine. I sent a proposal to Toon Magazine and got a call from the editor, accepting it. With that, I made arrangements through Hanna-Barbera to talk to Don Messick, the voice of Dr. Quest for most of the original series and all of the 1986 version. He was always the voice of Bandit and did a ton of other voices, including monkey squeaks as well as minor characters. But when I called Toon Magazine back to find out my deadline, I was told the editor who had OK'd my story was "no longer with the magazine," and I never heard back from them. However, I got an official list of JQ episodes that had their original air dates plus the production codes. And Don faxed me a list he'd made of all the voices he'd done for the show along with the recording dates. From Don's fax, I learned the working titles to some of the episodes: "Arctic Splashdown" had indeed started as "Splashdown Antarctica." For the rest, look through our Fact Sheet. Soon after I got Internet access (at my work), I found Richard Hill's "Palm Key" website and visited it again and again. Richard is/was a graphic designer and had some great material. Sadly for us, his work schedule took him away from the site and he eventually took it down. I soon had an AOL account and started putting up web pages to share my Jonny Quest research with the world. Then Lyle put up his page and we began corresponding. In late 1998, we registered the domain name ClassicJQ.com and combined our websites there. I finally got to meet Lyle when he was in the Dallas area for a training class. Here's a picture of Lyle and me from that historic week. 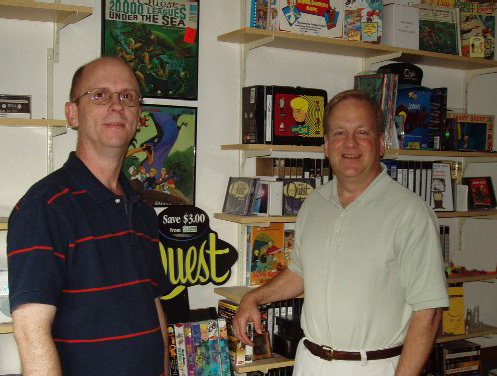 Craig, left, and Lyle, with part of Craig's Jonny Quest collection. Since junior high school, I've been a collector, going from one subject to another. I turned to Jonny Quest in the 1990s when I found out there were things to get. Before eBay, I only found a few things to buy (a production drawing from "Lizard Men" and the large poster by Doug Wildey. Once eBay was around, my collection grew steadily and you can see most of my collection here on the website. There are a few things I haven't gotten around to scanning yet, but they're coming. I've gotten more interested in the international JQ items that were produced within the first 5-10 years of the show. The website is very much a product of the visitors who've taken the time to send us news items, photos/scans, and corrections. Thank you all.